There are 7 scapulohumeral muscles that connect the scapula and Humerus. The role of these muscles are to stabilize the glenohumeral joint as well as to move the arm through all planes of motion. In order to assess the length of the scapulohumeral muscles, it’s important to first test the latissimus dorsi length. This gives you a ‘starting point’ or a baseline for shoulder flexion that you can expect to see during the scapulohumeral mucle length test. The proper position to assess the length of the scapulohumeral muscles is in supine (lying face up) with knees flexed to 90˚. Lie face up on a flat surface with knees bent to 90˚. Passively flex one arm overhead, keeping the thumb pointed upward so the Humerus stays laterally rotated. Monitor for these compensatory motions: the lateral border of the scapula protrudes more than ½ of an inch from the lateral side of the thorax. Other faulty motions may include scapular posterior tilting, anterior displacement of the humeral head, or excessive scapular abduction. Apply a correction to a protruding scapula by placing the arm in 90˚ shoulder flexion. Apply a manual pressure to the lateral border of the scapula so that it dos not protrude more than ½ inch from the thorax. At the end range, medially rotate the Humerus. If greater range is achieved, then the teres major is a primary contributor to the shortness. Decreased Range: If you are not able to achieve the same range as the latissimus dorsi test, you have found the scapulohumeral muscles to be short. Understanding the relationship between the scapulohumeral muscles and their length and flexibility can help to isolate the primary muscles involved in a restricted pattern of motion. If the lateral rotators or posterior capsule is tight, the following motions can be used as a stretch. I’ll list two here and welcome more within the comments! Prone Medial Rotation – Position yourself face down on an elevated surface with the humerus in line with the scapula so that your arm is in a 90˚/90˚ position (use a towel roll to support humerus). Perform pure medial rotation without pressing your shoulder into the towel roll (rotate your arm so your fingers are pointing towards your feet). Pure medial rotation is a conservative way to stretch the lateral rotators. Horizontal Adduction – You can perform this motion while lying on your back, standing, or in a chair. Raise your arm to 90˚/90˚ (shoulder and elbow flexion) and turn your arm so that it’s parallel to the ground (palm facing down). With your other arm, gently pull your elbow towards the midline of your body while trying to keep the scapula from moving. This might require support from the back of a chair or even lying on a surface so the scapula is blocked. 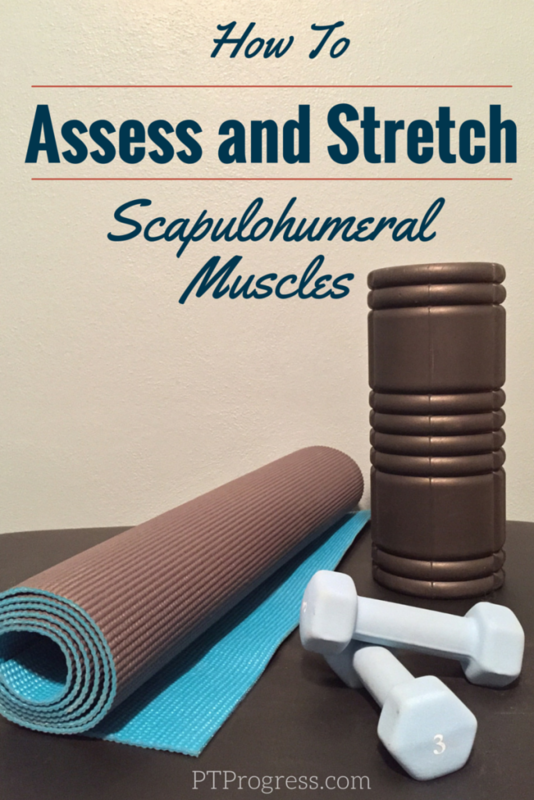 What other stretches would you suggest to help lengthen the scapulohumeral muscles? On my mother’s side there were three Missouri fmliay farms; in my husband’s fmliay there were four Colorado fmliay farms. Oh, the stories about near misses and mangled hands and feet, the calls for help from neighbors when a husband or son was bleeding after an accident or a child had fallen in a dry well!But all of my uncles, without exception, would say that while nothing is more dangerous than working with the land, it is also true that nothing makes you wiser and stronger than learning your lessons and counting your blessings while working with the land.You might be surprised how your daughter and son-in-law figure this out and make it work. If you go to help, please do the cooking, cleaning and bottle feeding of needy animals instead of tackling jobs with dangerous machines or beyond your comfort zone or experience level. We need you to be okay, too!